Most people think of Costco as the place that sells bulk quantities of pretty much everything. 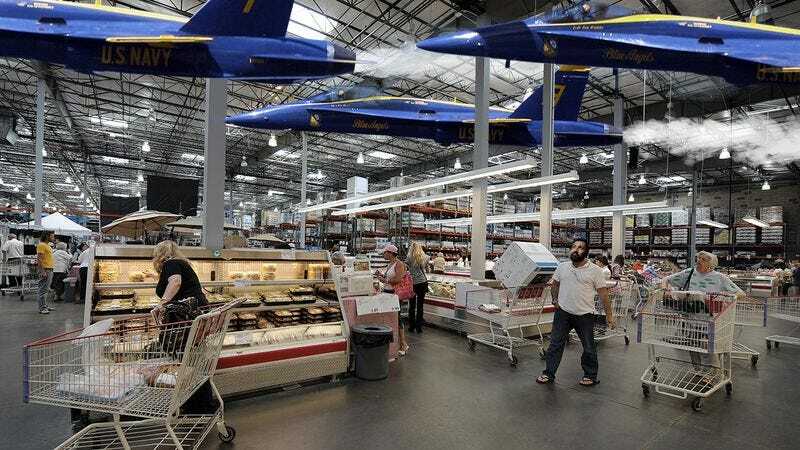 But the warehouse superstore is now making headlines for a very different reason, and it could serve to tarnish their brand: The Blue Angels accidentally flew into the Costco in Augusta, GA and are currently stuck flying around inside the discount retailer. Worst of all, it doesn’t seem like Costco has any idea how to get the airplane stunt squadron to leave. The Blue Angels were performing at a routine air show in Augusta, GA earlier today when they veered too close to the Costco and zipped through the automatic doors as they slid open for a customer. Before Costco employees could react, the diamond formation of five F/A-18 Hornets had entered the store and began performing death-defying aerial feats right over the shelves of bulk cereals and jumbo-size ketchups. Customers are trying to ignore the roaring jets overhead, but it’s hard to concentrate on your shopping list when sonic booms keep knocking over pallets of Kirkland-brand dog food. It’s usually a welcome treat to see the Blue Angels conduct synchronized barrel rolls, but inside Costco, the elite pilots are proving to be a serious nuisance. So far all attempts to evict the Blue Angels have proved unsuccessful. At first, Costco staff just propped the front door open with a bucket, assuming the Blue Angels would find their way back out eventually. After an hour, when choreographed smoke trails continued to plague the store, the manager grabbed a lacrosse stick from a sporting goods display and tried to shoo the planes toward the exit. Unfortunately, that only caused the Blue Angels to accelerate to 700 mph and perform several loop-the-loops in the freezer aisle, where the pilots hit a truly exhilarating 8 G’s. Your heart just has to break for this poor manager. With the store set to close in only a few hours, Costco better think up a solution fast, or Blue Angels will be locked in overnight. If that happens, then tomorrow’s customers will be aggravated by more of the same world-class aeronautic showmanship. What an absolute hassle.